Create the essential three videos for your Integrated Video System. These videos work together to guide your Ideal Prospects through the Customer Journey to buy your stuff. Say goodbye to the “Lone Video Syndrome” and say hello to a predictable revenue stream for your business. How to set up Facebook video ad campaigns that laser targets your ideal customers. Start by building your Custom Audiences from Cold Traffic with Video Views campaigns. 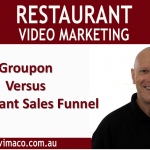 The retarget them with valuable Content Videos to build the ‘know, like and trust’ factor.Finally use retargting to place your offer in front of a Hot Audience that are ready to buy from you. Use brand videos to position yourself as the authority in your niche. When you get in front of the video camera, you establish authenticity and quickly differentiate yourself from the rest of the crowd. People buy from those they trust and video is the is most effective way to establish your credibility. Use the 10 essential steps for the Perfect Call to Action video using the 3 key motivators; Fear, Desire and Logic. Each step is designed to walk you through the creation process and ensure your CTA video moves your audience to take your desired action. Starting Now. Grab Your Spot.